Two events today reminded me just how ubiquitous is the belief that horses are born with a taste for carrots, apples, oats and other assorted treats. I have seen many new horse owners, or barn visitors, crest fallen when their special offering of a sliced apple or crunchy carrot is met with disinterest. Yet, most non-horse people I’ve met can list carrots, apples and oats as the things horses eat. Case in point … I had lunch today with a good friend – part of my ritual in the week before Christmas, where my days are filled with meeting friends for lunch and gifts. This particular friend is not an animal person on any level. She enjoys seeing them from a distance, but is not very comfortable around them. Still, she is curious and seems to enjoy asking me questions about their care and behavior. On this particular occasion, she was asking me what horses eat. Apparently she was reading a book about “what my pet eats” with a young child … and they were stumped when it came to the horse. Top of their list were carrots, apples and oats. Nash enjoying EVERY horse’s favorite food. always been so. I have had to teach a number of horses the joy that can be had from the orange, crunchy treat. Chief among these “students” was young Mr. Noble. In his case, the “lesson” was complicated by his lack of trust of people. If such foods are not nutritionally necessary, why go to the trouble of teaching him? Because carrots and apples can be training gold! Carrots helped me change Tally from highly vigilant and reactive to anything new, into a now bold and curious explorer. So, how do you convince an animal with whom you have no verbal communication to give a new, suspicious food the taste test? By using one of the “seven deadly sins” – envy, of course! It works every time – even across species! The first time I offered carrots to our dogs, I was met with expressions that could only be read as “You have to be kidding! We don’t eat vegetables!” First one, then the other had the same reaction. It happened to be that we were in the barn, so I shrugged, turned around and gave the carrot to the nearest horse. The effect was definite and immediate! My dog watched the horse munch the carrot, then placed herself squarely in front of me with a look of expectation. This dog, who just seconds before could not be bothered with an orange root, had clearly changed her mind! The moment that I handed my dog a piece, which was quickly munched down, my mom’s dog came running over to see what the crunching was. Suddenly she was dancing in front of me, on her hind legs, asking for her share. They were carrot dogs from that day forward! 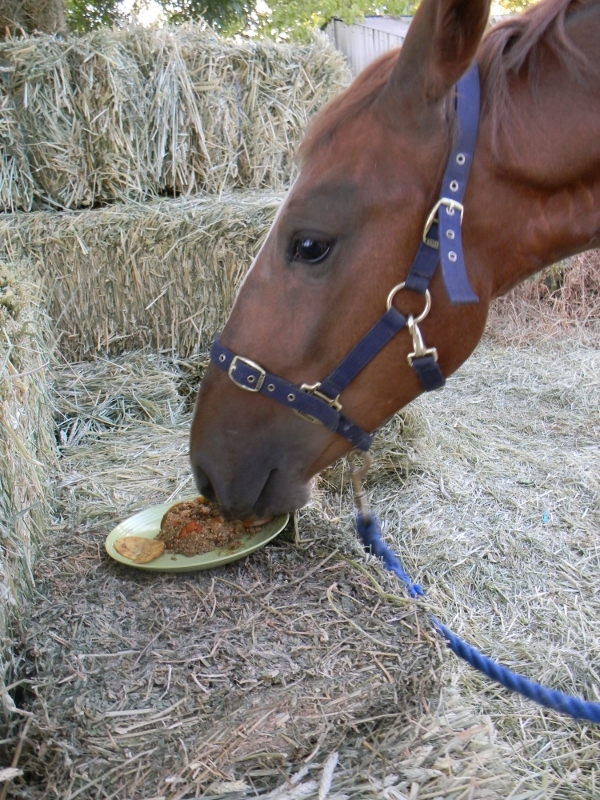 Noble and his “birthday cake” – a mix of oatmeal, molasses, apples and carrots … of which he only ate the carrots! this change only meant a return to a pelleted supplement he was eating earlier this year – all other products in his supplement remained unchanged. Yet, that one little change was enough for him to refuse to eat his lunchtime grain. His first reaction was to dump the filled feeder on the ground. My mother dutifully replaced it, hoping he would later decide to eat it. Tonight we found his tub in the aisle, remnants of the food within … the remainder in a pile on the ground next to the tub. Clearly this new combination is not to his liking! The plan was also to introduce some oats to the mix for everyone. With Noble’s reaction to the one simple change, which only involved a food he previously ate, I decided to see how he would react to the oats. It started out all right. He now trusts me enough to try anything I offer by hand. A couple of mouthfuls and I thought, “No problem, he likes it.” Then … the mouth opened wide and he began to work very hard at spitting it all out! It was “no go” after that! So, while carrots, apples and oats are often appreciated – they are acquired tastes, not natural horse food. I have known horses who have never taken to one or more of those items. On the other hand, horses can take a liking to many other things. Peppermint is popular with many horses. Watermelon has been a popular treat with most of my horses, but not all. 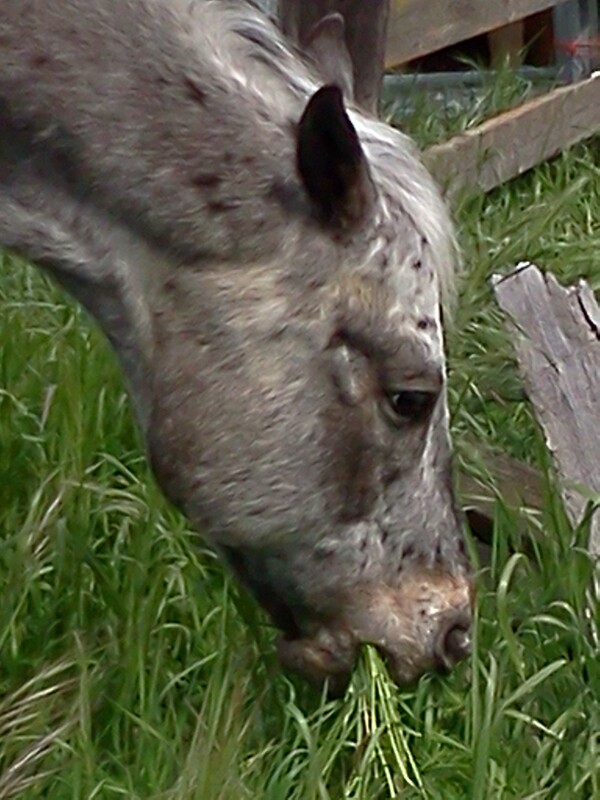 All parts of the corn plant are appreciated by many horses. Just as with any other domestic animal (people included), the possibilities can be endless. If Noble is the fussiest horse we’ve had (and he is), then Ben was the most adventurous equine. His favorite treat was those gum-drop type orange slices, but he also like real orange slices – which you could feed to him unpeeled and he would spit out the completely stripped rind. His willingness to try anything extended to potato chips, cheese and even salami! Anything I would eat in his presence, he would attempt to share with me. And his adventurous palate was not limited to solid foods – he was also willing to imbibe a variety of liquids as well. Among his favorites were Pepsi Lite (remember that lemony cola? ), Mountain Dew (we stopped that when a drug tester warned us of the caffeine, which is a banned substance for competition horses) and beer. My horse shoer was notorious for sharing his beer with Ben. Once, one of his cowboy pals left a half-full can on the rail of the arena. Ben, who was loose in the arena, headed straight for it. He bumped the can and looked back at me. I obliged by holding the can up and letting him finish it – yes, he could drink straight from bottles and cans … he just needed the hands to hold them up! This entry was posted in Just For Fun and tagged acquired tastes, apples, carrots, envy, mythbusting, Noble, oats, treats. Bookmark the permalink.